Some people don’t belong in our lives. We don’t seek communion with Satan. God will guide us to minister where He is opening the door for ministry. He will lead us away from ungodly counsel and fake information pushers to those who speak by His Spirit. We must desire this and ask Him for this leading. We see a concerted and organized effort to destroy the basics of God’s orders. It’s going to the point of complete insanity being taught in schools and on news services. We know that Satan is the one setting all this in disorder, but he’s using people in a loosely-knit unity-in-diversity, new age networking system. We see the ever-expanding “sexual revolution” (the sin of Balaam), drugs, stealth occultism, the big-bang-billions-of-years-no-Flood-molecules-to-humanity story, coercion against truth using powerful governmental forces, political correctness as a way of message control. They control every form of communication to the point of censoring Christians on social media. There’s much more to the rapid changes we’re seeing in the world, but these few methods show the types of methods that are causing the changes. These methods seem to focus on destroying connection with Christ through the Bible, the Church, and the home. These seek to destroy faith, the faith that comes by hearing the utterance of God. Atheists and other ungodly thinkers also love to bait us and try to make us angry. I’m talking about the trolling discussion groups like the fake Kent Hovind groups or the fake Creationism group. I’m talking about trolls who pop into our conversations uninvited. They come with personal insults in hopes of making us angry. They know that when people get angry, anger makes them less intelligent. Angry people say stupid things. If they can get us to say something stupid, that’s a huge victory in trying to justify their foolishness in denying God while God is revealing Himself to them through our testimony. Don’t fall for it. Better to block trolls early rather than giving them a platform. The publisher has finished proofreading and is now working on formatting. After formatting the ebook, many of the internal links will be broken. 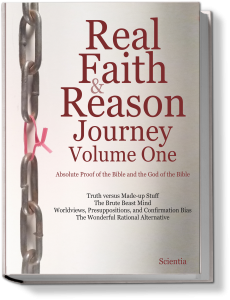 Once those are repaired, the Real Faith & Reason Library will go out to selected people as an advance reading copy (ARC). If you would like to have an early copy, I would welcome your feedback. Send me a friend request on Facebook: @PetrosScientiaAuthor.